The amazing, versatile pillow that changes its shape in seconds. The Total Pillow is the amazing, versatile pillow that changes its shape in seconds for perfect support so you can bend it, twist it, shape it to fit your needs. The Total Pillow is filled with tension-easing micro-beads and covered with brushed microfiber/stretchable fabric for comfort. The Total Pillow supports your neck, ankles, knees or anywhere you need total comfort! 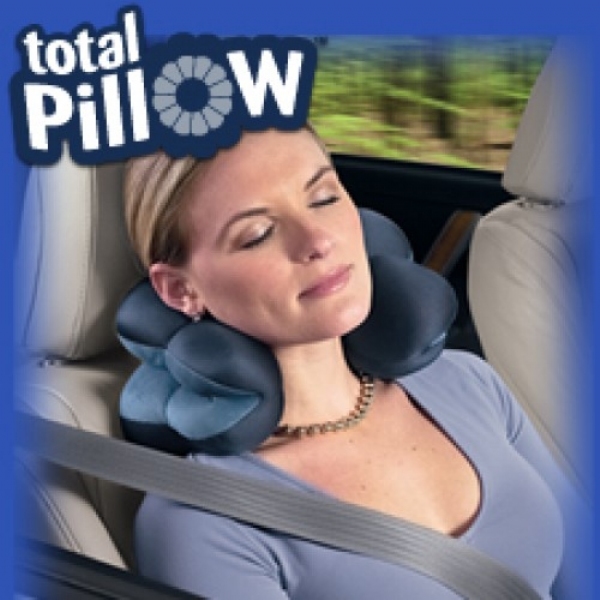 You can use total pillow anywhere, on a plane, in a car, watching TV, playing games. I love it! Have been using them for years. I started using this pillow after my surgery, for support and comfort I also use this every night between my knees it is a great positional pillow for most any body part that needs support I am buying two more as mine is now 4 years old and I have worn this thin. I would recommend to anyone who has chronic pain and needs comfort As I stated it is my very favorite pillow. My husband and I both use a pillow between our knees at night. This one is perfect! My chiropractor suggested I use one to take pressure off my spine as I sleep. My husband uses it just because it&apos;s so darn comfortable. I thought thta this would be an open pillow that I could use as a neck pillow, but it is to small to use that way. I have a neck/shoulder injury and sometimes the pain is so bad I can&apos;t sleep AT ALL because having no support for my neck causes bad pain with any movement. I tried a few pillows none helped that much until I tried this one! I swear it was TOTAL relief. The way it folds gave my neck amazing support taking away the pain and pressure. Then its very soft and comfortable so I slept with it around my neck and It was like a life saver for me! I bought one for a friend with neck problems like mine and they love it too! I had a cervical fusion and have suffered with neck pain for 8 years. I have finally found the perfect pillow, Total Pillow. I have to sleep with it and it is the perfect thickness to fill the gap in my cervical area. I double it up to read and travel with it in every mode of travel. Should you have trouble with it while sitting on a seat with a full top such as a stuffed couch or airplane seat, my suggestion is to move the pillow down toward your shoulder blades, which then takes up the space between your cervical area and shoulder blades. Likes to sleep this may work for you. I am going to order a few more so I never have to be without the Total Pillow. Although there is no cover, the pillow is completely washable (delicate, hang dry). I love it. The Total Pillow is smaller than I expected! Need it to be a little larger! Haven&apos;t used it yet, so don&apos;t know if it would be comfortable on the place for 13 hours or more!! We&apos;ll see!! This pillow helps lift my head so there&apos;s less strain on my neck and shoulders. I can now lay with more comfort whether I&apos;m trying to sleep or propped up to watch tv. My mom has one and I was using it. I had to get one for myself. I use it to relieve pressure from surgery. It works great to sit on, better than the plastic ones. Already used it on a 600 mile trip (when I wasn&apos;t the driver!) - great! On side of head to Lift head from pillow to watch TV. On neck for comfort. On luggage handle for travel, on leg for sleeping on side, on face for sleeping face down. Sit on it for comfort, on cheek for laying on side. Not so great---Some are too full of beads and are too hard and some do not have enough beads and are too soft. Not consistent. You need to feel them before you buy them. Thie pillow keeps me comfortable when sleeping on a plane or in a car and it keeps my neck supported so I don&apos;t have neck pain later. Great! Excellent for those with neck injuries! I HAVE A LOT NECK PAIN FROM FIBROMYALGIA, THIS PILLOW GREAT WITH ITS FIRMNESS AND THE WAY YOU POSITION IT. ONLY COMPLAINT I HAD ONE THAT BUSTED OPEN ONCE, WHAT A MESS. I DOUBLE CHECK ALL SEAMS FROM NOW ON. Great to use when you travel, it also makes a wonderful back rest at the computer. Just slip it over your carry-on luggage handle so you don&apos;t even have to carry it! Nice design, pretty durable.. mine is just pulling at one seam and some beanies came out, easy to stiich back up. I will order more for presents! I have 2 different ergonomic chairs I acquired from work because I work from home; an Areon and another brand. I am about 5&apos; 1 and neither chair fits quite right for my small frame. I did not have enough lumbar support because if I have my feet flat on the ground, my back does not line up with the built in lumbar support and I&apos;m closer to the edge of the chair then the back of it. I bought this and it supplements the lumbar support perfectly. I can also take this with me since it&apos;s small and portable or use it for my head or arm since it is versatile. Have to buy a second one because my girls fight over it for car trips and when they fall asleep want to rest their heads on something in the shopping cart. Holds its form enough to be comfortable on most anything. Also love the double textures-silky cool on one side, plush warm on the other.